As the PGA Tour season comes to a close and enters "silly season", it is up to amateur golfers to decide whether or not to stash their golf clubs in a corner of the garage or to embark upon an extreme experience to an exotic locale. The serious player never wants the season to end! 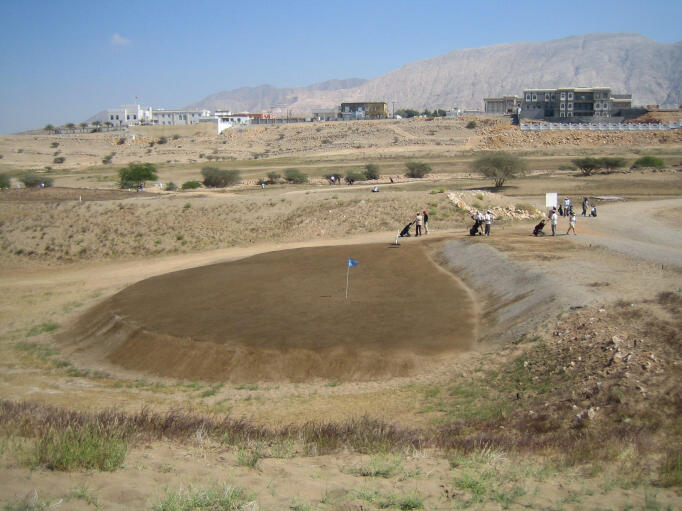 From "ice golf" in Greenland to playing "sand" golf in Dubai, experiences that challenge the senses as well as your ability are worthy of the trek, and the "fun factor" of being on unfamiliar territory will surely be a memorable experience. Although temperatures rarely climb above -13 degrees celsius and with a wind chill factor that sometimes makes it feel as if it is -50 degrees in the sun, (did I just say negative 50?) 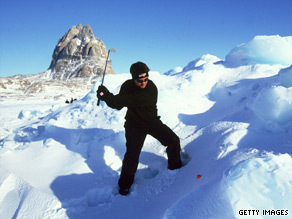 Uummannqaq, located north of the Arctic Circle, is home to the World Ice Golf Championships held in March.. I wonder if there is a large crowd on hand to watch the final round? The west side of the island is also home to Santa Claus, who is storied to live in Spraglebugten Bay. I always thought Kris Kringle carried his own clubs by the size of his toy bag! Speaking of cold weather golf, although you could just play in your own "backyard" donning an extra sweater and some warm weather gloves, also consider a round at the northernmost USGA golf course in the world: North Star in Alaska. Permafrost creates an ever-changing pattern of dips and swales so no two shots are alike. Be prepared for two games in one when you play here; one event is naturally golf and another is a checklist of the wildlife encountered on the course. For golfers who want to play whenever the mood strikes, head to North Cape in Norway, in the land of the midnight sun. From mid-May through August, your round can start literally at 10 pm! During your northerly adventure, take the Awesome Eight Golf Challenge. Thought up by extreme athlete Robin Sieger, golfers must complete the challenge by playing "eight of the most remote and climatically most extreme golf courses in the world within the span of a year. The only condition is that they carry their clubs, not using any caddie or cart." There are some of us who are snowbirds and others who fly south as soon as the temperature falls below 40 degrees. If you can't stand the sight of snow or blue extremities at the end of a round, perhaps the world's hottest locale is a better fit for you. Merapi Golf Club in Indonesia confirms that they have the world's "hottest" green as well as panoramic views of Mt. Merapi. Also known as "Mountain of Fire" this active volcano not only dominates the surrounding landscape but has been active for 10,000 years and regularly erupts every one-to-five years. I would not want to be putting for birdie when that volcano spews! For those of us who love the sight of active volcanos, your vacation is not complete without a trip to the Volcano Golf and Country Club located on Hawaii's Big Island. The high altitude makes the golf ball go farther (which is better for shorter hitters) and the views of Mauna Loa and Mauna Kea mountains (they are snow-capped in winter) are sweeping and memorable. For golf with no "greens" try a round of sand golf at Dubai's first golf course, one of two located at The Dubai Country Club. Called "browns", the putting areas on these two desert courses are a "mixture of sand and second hand engine oil compressed with rollers". Brooms are located near each hole so that the golfer can "brush" to smooth out footprints. Of course these are just a few of the marvelous experiences created for golfers around the world. Thanks to the internet, adventure is just a "click" away. Seek and ye shall find, for the adventurous sort! Subscribe through this RSS feed or through iTunes.